This very simple but highly stylish CV includes a classic burgundy bar at the top to highlight your name and profession, and sections for all of your information underneath. If you want to create a second page, all of the elements are editable and can be deleted or adjusted in Microsoft Word if desired. This smart CV template uses the Aparajita font (download link below). Burgundy creative CV template with a bold header and two columns	Overall rating:	3.6	out of 5 based on 3	reviews. If you like the idea of using colour in your CV but still want something traditional and classic, this CV template is the perfect compromise. 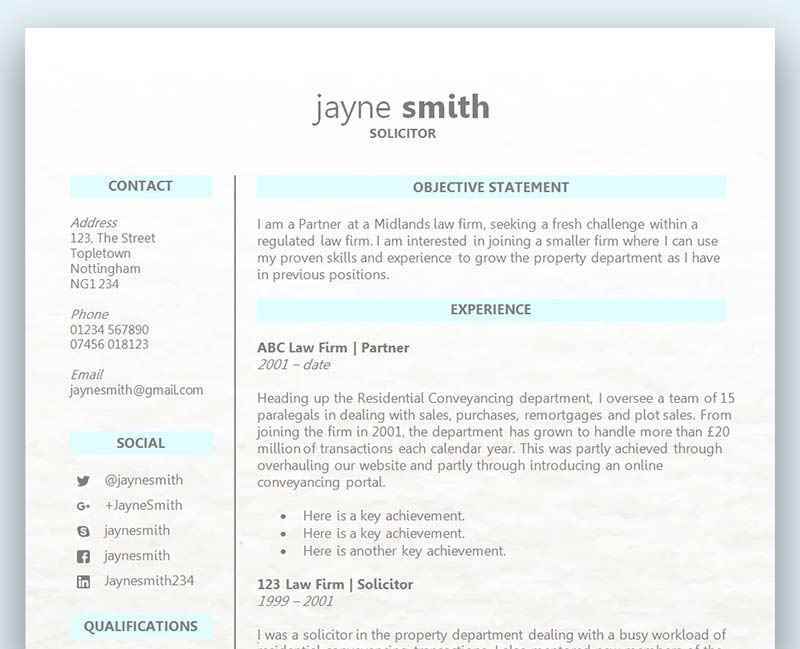 It uses a burgundy header and soft grey panel to separate your information and keep everything perfectly organised for prospective employers to review. If you have a work history then you are going to find it very easy to complete this part of your CV. But simply stating the job title and tasks/responsibilities is not going to make your CV stand out. When writing a CV you’re expected to list down all your previous roles along with the tasks and responsibilities, however an employer is looking for much more than that. Remember, it’s not too difficult to figure out what you were doing in that previous job from the job title itself, and simply listing the tasks isn’t going to score you any points. If you want to get ahead of the competition you need to delve deeper into your work history and bring out all of the relevant achievements and results. The hiring manager is looking to see how well you performed in that role, which is only going to be visible if you actually provide your outstanding achievements and results. Depending on your previous results, you may be able to actually provide real stats and figures as to how you performed. For example, let’s say you were applying for a new sales role and you had previous sales experience. The new employer is going to want to see some great results from your previous roles, which is exactly why you should utilise this section of your CV to showcase how well you’ve performed. This could apply to anything, and not just sales. However, it’s important to remember that you must only provide results and achievements that relate to the new role you are applying for. Sometimes this may be easy to do, but you can of course also highlight transferable results.